async - volume - presents an oblique, behind-the-scenes portrait of Ryuichi Sakamoto and his creative process. 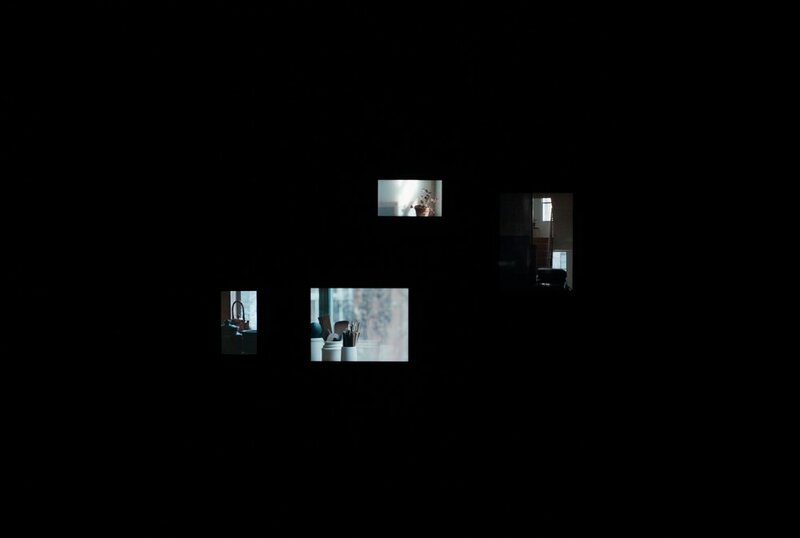 Natural field audio captured in his studio entwines with musical stems from the async album to create an ever-shifting ambient soundscape, while 24 screens, each playing a looping video of these spaces, are arranged in a darkened room like a photographic montage. A womblike window into Sakamoto’s audiovisual environment, the piece collapses into a murky, abstracted space-time, allowing the viewers to enter the composer’s subjectivity, where his everyday surroundings become indistinct from the music that they inspire. Though Sakamoto doesn’t appear in the videos, one feels his presence—in another room, perhaps, or moving around just off-screen. The images and sound are no longer perceived as separate channels, creating a new form of embodied perception, one which renders the installation space as a volumetric portrait of Sakamoto’s subjectivity. Viewers who spend time within this psycho-landscape shift modes of listening from a causal one to one that is more abstracted and less literal, disconnecting sounds from their direct sources to focus on the qualities of the sound itself. The videos, and their sounds, loop independently of one another, making it unlikely for the viewer to experience the same sequence of events twice. Time, in such an asynchronous environment, sublimates into an elusive and fleeting cloud, creating an experience that describes a lived, psychological time where music and sound, work and recreation, and the mundane and the heightened all tumble together into an indistinct flow.